We provide different types of strapping for a variety of industrial and commercial applications. 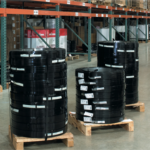 We offer two different types of strapping: polypropylene, and steel. Machine-Grade Polypropylene Strapping: This product features high elongation and recovery with low tension retention for tight, strong, safe, and fast strapping. Hand-Grade Polypropylene Strapping is made for use with hand strapping tools and strapping carts. Polypropylene strapping retains loads better than steel or nylon strapping because it can shrink along with loads while maintaining tension. Steel Strapping: Choose from either our regular duty or high tensile types of steel strapping. Regular Duty Steel Strapping: This strapping is a medium carbon steel strap that is cold rolled and engineered for higher breaking strength while also being a thinner gauge than regular-duty steel straps. Sizes range from 3/8” (9.5mm) to ¾”; (19mm) Width and .015 to .028 Thickness.